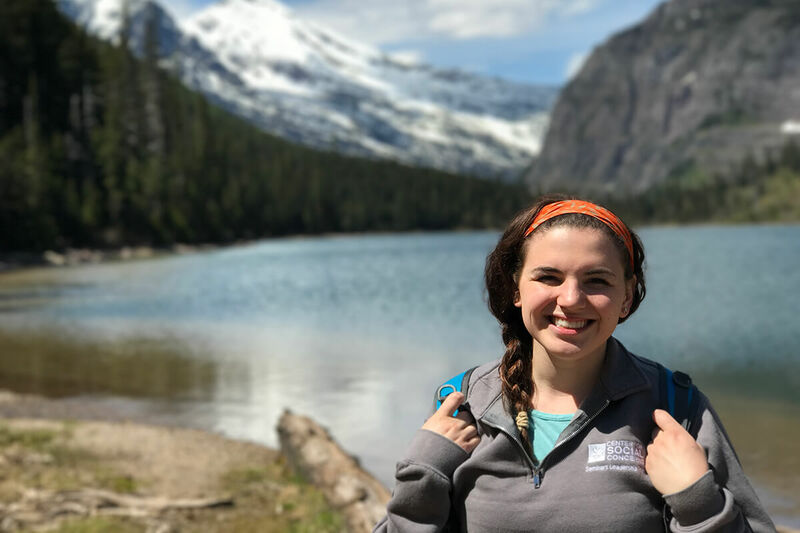 Senior Moira Stotz traveled to South Dakota and Montana to complete a project inspired by her History of American Indian Education class. From the capital of Uganda, to American Indian reservations, to museums across the country, Notre Dame students travel around the world to carry out academic projects with help from the College of Arts and Letters’ Undergraduate Research Opportunity Program. With UROP’s financial support, students are able to engage in on-site research that can be used as the basis for a variety of independent projects, including a senior thesis. The experiences made possible through UROP not only lead to meaningful results, but also provide students with valuable life experiences they might not otherwise have. Adam Moeller with Judith Alyek, chair of the Ugandan parliamentary committee on HIV/AIDS. 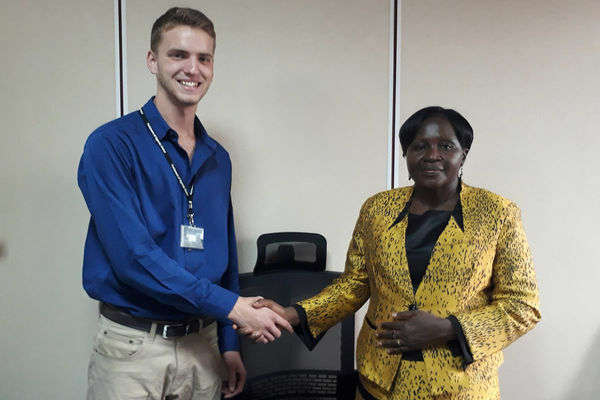 Moeller, a history and economics major, spent eight weeks conducting interviews with members of the LGBT community in Kampala, Uganda, for his senior thesis. In Uganda, where homosexuality is illegal, members of the LGBT community consistently face intense discrimination, violence, and isolation. With no academic sources on the topic, and very few articles written prior to the last few years, Moeller hopes to provide one of the first historical accounts of the community. Before traveling to Kampala, Moeller worked closely with his adviser to perfect his interviewing skills and prepare a list of questions to reference during his three dozen interviews with identified members of the LGBT community, activists, allies, politicians, and people in religious institutions. With more than 50 hours of interviews, Moeller is well prepared for his senior thesis project, along with his future in teaching. He plans to teach after graduation and has applied for a Fulbright grant to teach English in Malaysia. Moira Stotz filming interviews on location in South Dakota and Montana. Just two days after completing her finals last May, senior Moira Stotz traveled to Red Cloud Indian School in South Dakota and De La Salle Blackfeet School in Montana to complete a project inspired by her History of American Indian Education class. 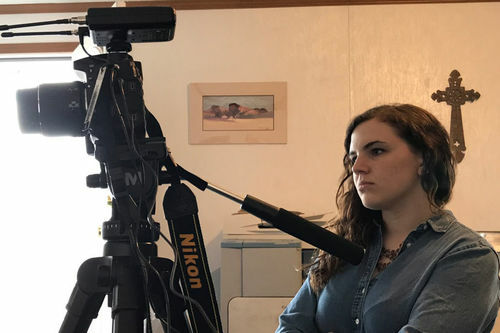 Stotz, a neuroscience and behavior major and education, schooling, and society minor, spent 10 days interviewing and filming students and teachers at the schools, which are part of the American Indian Catholic Schools Network, managed by Notre Dame’s Alliance for Catholic Education. She and her creative partner, junior Tyrel London, created a promotional video to raise awareness of the schools’ missions and programs that benefit children on the reservations. As Stotz prepares for her own future in education, the time spent at Red Cloud and De La Salle Blackfeet will be helpful in developing her teaching style. 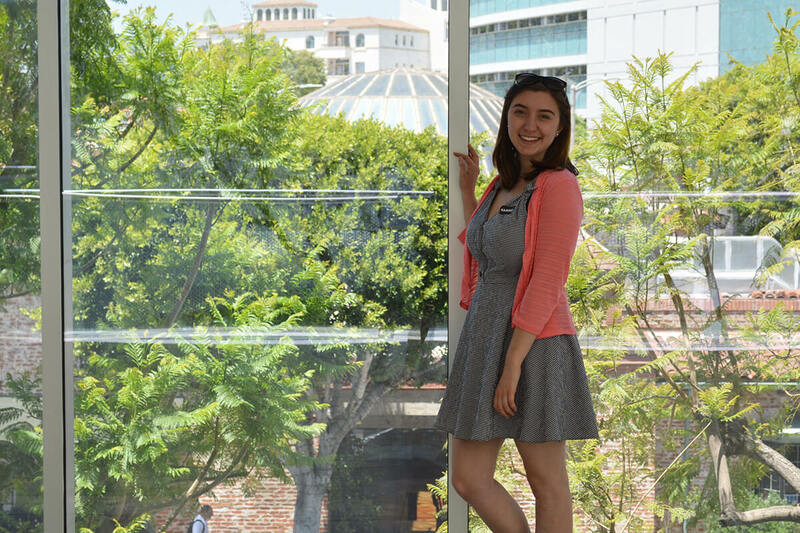 Sophomore Amber Grimmer traveled to museums in Los Angeles, California, and Chicago to explore the impact that key pieces of art relating to social change have had on the community, artists, and social commentary. Sophomore Amber Grimmer, an international economics and peace studies major, has always been interested in the topic of social justice. After taking an honors humanities seminar, she was curious as to how she could relate this topic to modern art. With funding from UROP, she traveled to museums in Los Angeles, California, and Chicago to explore the impact that key pieces of art relating to social change have had on the community, other artists, and social commentary itself. Grimmer, who is also pursuing a poverty studies minor, hypothesized that art forms such as Dadaism, Mexican Muralism, and Social Realism paved the way for other art to be a form of social commentary and movement. Grimmer now encourages other Arts and Letters students to apply to the grant program — whether their research idea is big or small. Originally published by Teagan Dillon at al.nd.edu on December 13, 2017.